Thursday, February 9th, Cycropia welcomed aerialist Elizabeth Blanchard to Madison for an aerial straps/conditioning workshop. 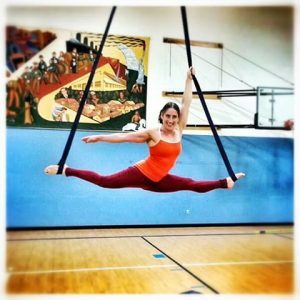 Based in Las Vegas, Nevada, Elizabeth specializes in aerial straps, pole, lyra, aerial hammock. Elizabeth is also a member of the ‘Girl Next Door Show’, ‘Kelly Yvonne Production Company’ and ‘Music of Ghosts’ Aerialist group. Thank you Elizabeth for a wonderful time!